Thanks to Ruth Ayres for creating this space to share our celebrations. Please check her blog to see other celebrations or check Twitter for #celebratelu. On November 12, I received this message from Kevin Cordi, Assistant Professor at Ohio Dominican University and one of the co-directors of the Columbus Area Writing Project. I thought it was one of those hacked messages from friends that say if you send $250.00, you will receive $5,000.00 in return. Kevin immediately assured me that this opportunity was for real. And of course, I was in! His idea? The Poetry Box Project. First, a little history. In 1995, Kevin had a friend from Brazil who said to him how nice it would be to be able to share their stories. That simple statement was the beginning of the Story Box Project. Since then over 50 Story Boxes have been launched all over the world, collecting the stories of people from all walks of life. 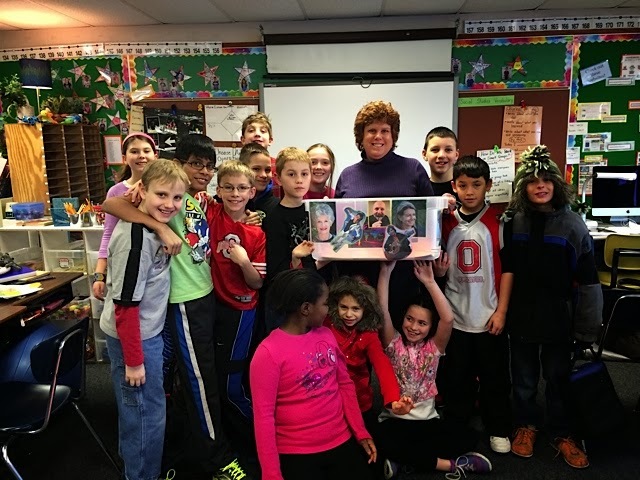 (To read more about The Story Box from Jen Mitchell an ELL teacher in Dublin, Ohio, and a teacher consultant with CAWP, read her blog post here). The Story Box is what inspired the dream of the Poetry Box Project. He asked himself, "What if we could get published children's poets to write the beginning of a poem with the intention of letting children finish them?" 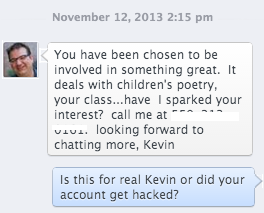 Kevin shared his dream with J. Patrick Lewis, the U.S. Children's Poet Laureate from 2011 to 2013. Together, the two of them contacted many poets, asking them to submit an unfinished poem for the Poetry Box project. In the end, over 20 poets submitted poems that are now housed in the Poetry Box. Schools from all over the United States will host the Poetry Box; their students also completing the unfinished poems. When the box returns to Columbus next year, it will be filled with poetry from hundreds of children who were inspired by the very gracious children's poets who were willing to send in their work. In addition, each teacher who hosts the box agrees to write an article about the importance of children's poetry. Kevin is working to publish a book with input from each of the teachers involved. So where do I come in? Kevin asked me if I would want to be the first to host the Poetry Box. I didn't hesitate saying yes to this wonderful opportunity. I immediately sent an email out to my colleagues at Scioto Darby Elementary, asking if anyone wanted to join me. Seven different teachers were as excited as I was and jumped on board. In addition, the art teacher is collaborating with us to help the students create images to go with their poems. 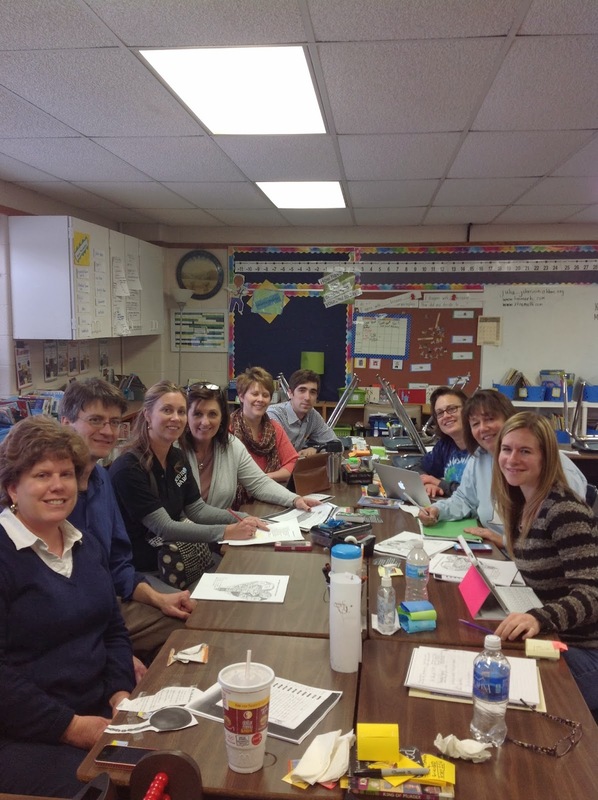 Two third grade teachers, the art teacher, his intern, the intervention specialist who co-teaches writing workshop with me, two other fourth grade teachers, and the media specialist all met last week to make a plan. 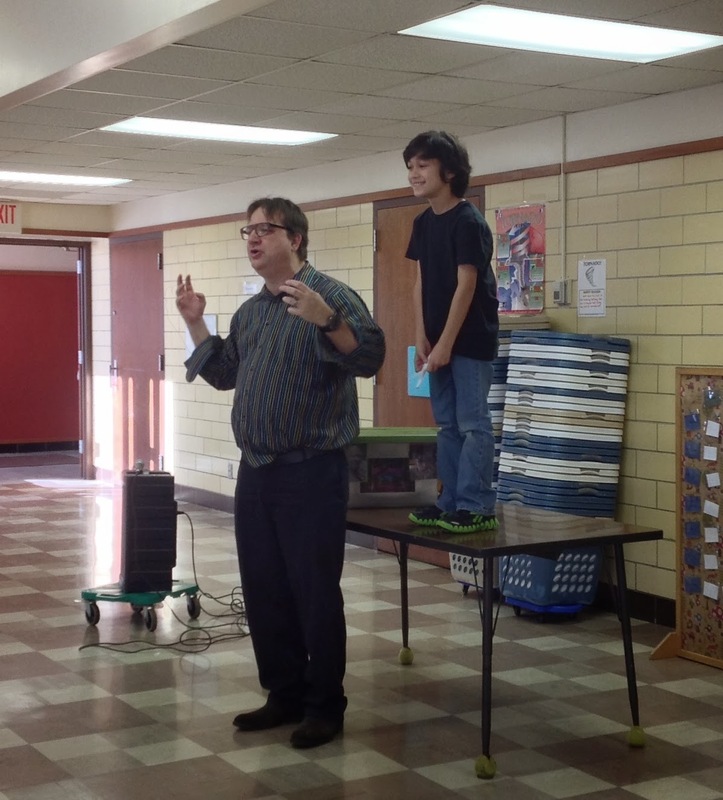 Our official kick-off was yesterday, when Kevin came to our school for the unveiling of the Poetry Box. Kevin, who is a professional storyteller, is dynamic to say the least. He spent time telling the kids about the history of the Story Box project, reading poetry from J. Patrick Lewis and Ken Nesbitt, the current Children's Poet Laureate, creating some impromptu free verse with members of the audience, and finally, the unveiling of the Poetry Box. The kids were jazzed to say the least...if they weren't excited about poetry before the assembly, they certainly left excited. In fact, my room was buzzing all day yesterday as the kids talked about the possibilities. You can get a glimpse of Kevin's energy in the clip below. Unveiling The Poetry Box from Julie Johnson on Vimeo. One of our third graders shared his poem about writing poetry. His poem will go on top of the Poetry Box as inspiration to others. 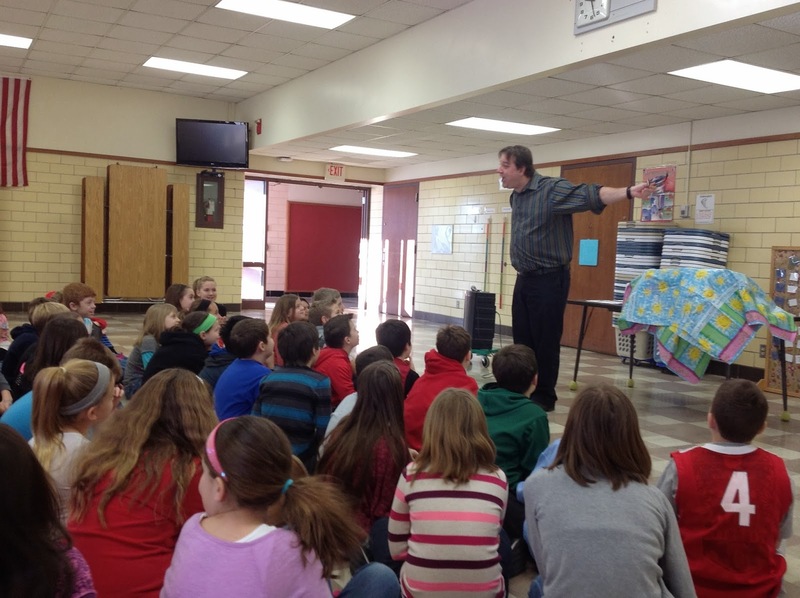 The students at Scioto Darby are honored to be the first school to host the Poetry Box Project. We will be sending the box off to its next destination (Chicago, IL) on February 24th at the Thurber House. Here, a few students will read their poetry and all of the children's poetry will be displayed. J. Patrick Lewis and Kevin, along with other local poets will speak and share some of their work. Over the next few weeks, I'll be sharing our process and more information about the finale in February. We can't wait to dive into the poetry and see what we are inspired to create. Thank you Kevin for this wonderful opportunity. Here are just a few of my kids as they came into school Friday morning, excited for Dr. Cordi's visit. If you would like to participate in this unique experience or get more information, please email Kevin at kcteller@sbcglobal.net or you can call his cell phone at 559-213-0161. I hope that some of you will be inspired to join. I'll check with the teachers, Julie. It sounds just awesome, and many kudos to you and your school for being the first to open and respond to The Poetry Box! I look forward to reading more about this project as it evolves! Just emailed Kevin and will discuss this with my team tomorrow! Exciting, Julie! Poetry!! Thanks Kevin and Pat for this exciting to project to honor and inspire poetry. May the box travel far and wide and return filled with the outpourings of many hearts and souls. This sounds fabulous! What at exciting project. I can't wait to follow it's progression. I can't believe I didn't comment on this post. I think I was probably so excited that I just sped off to explore more about the Poetry Box. I just got word that I will be hosting the box in October. This is all thanks to you and this post where I first learned about The Poetry Box project!